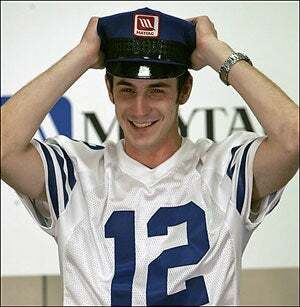 Indianapolis Colts backup quarterback Jim Sorgi — he of the crushed larynx and perpetual clipboard — apparently has a stiled, if bemused, sense of himself: He is actually applying to be the Maytag repairman spokesperson. On Tuesday, Sorgi attended the auditions as part of a promotional agreement with Whirlpool and went through the process like everyone else. In a pep talk delivered during his videotaped audition, Sorgi told an imaginary washer and dryer: "You're King Kong, baby, nobody can defeat you!" We find it charming that the image of the beleaguered Maytag repairman has lasted throughout the generations, though we didn't realize that the outfit made professional quarterbacks look like members of The Village People.